Iranian media claimed a new type of radar is ready for deployment with the country’s air defense forces. 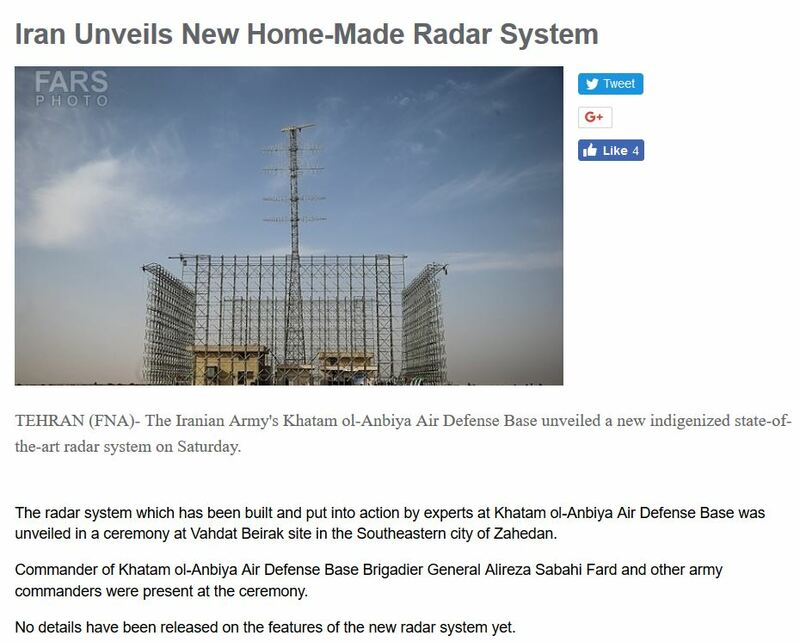 This week Fars News revealed the “Khatab al-Anbiya Air Defense Base” held an unpublicized ceremony where a “radar system which has been built and put into action” in the city of Zahedan. Located near the borders of Afghanistan and Pakistan, Zahedan boasts an international airport and rail links stretching across the Balochistan desert. The adoption of another radar system suggests Iran’s military is fortifying national airspace although its deployment to Zahedan is surprising. The city’s proximity to the Afghanistan and Pakistan borders means it’s a transit hub but the immediate dangers it faces, besides rare incidents of local terrorism, are unclear. The organization known as the “Khatab al-Anbiya Air Defense Base” is recognized as a separate branch of Iran’s armed forces responsible for coordinating Iran’s various anti-aircraft capabilities. For them to establish a radar installation–whether it’s fixed or mobile was never revealed–means the city is of strategic importance, which it should be since it forms a vital link to the Chabahar Port being financed by India. In recent years Iranian media have promoted different locally made radars meant to cover national airspace. The most advanced was the Nazir installation rumored to be operational at a remote high altitude base in the northwest. The Nazir, an over-the-horizon or OTH radar, allegedly has a range of 800 kilometers and covers Iran’s mountainous interior. Coastal radar sites also guard the Arabian Sea and the Gulf of Oman. If the unspecified radar system in Zahedan is a fixed site on a base, then its purpose is enlarging the scope of the Nazir installation, whose range still leave’s Iran’s periphery unguarded. Iranian media and official statements have remained on message through the years by insisting locally made radars for air defense purposes are able to thwart drones–such as the US-made RQ-170 Sentinel that crashed inside Iran–and track “low radar cross-sections,” implying these can defeat stealth aircraft. Iran’s air defenses are a combination of Chinese, Russian, and domestic weapon systems meant for shielding its largest cities and sensitive nuclear research facilities in Bandar Bushehr and Natanz. The capital Tehran, for example, is fortified with concentric rings of long and medium-range SAM batteries that would discourage any war planner. 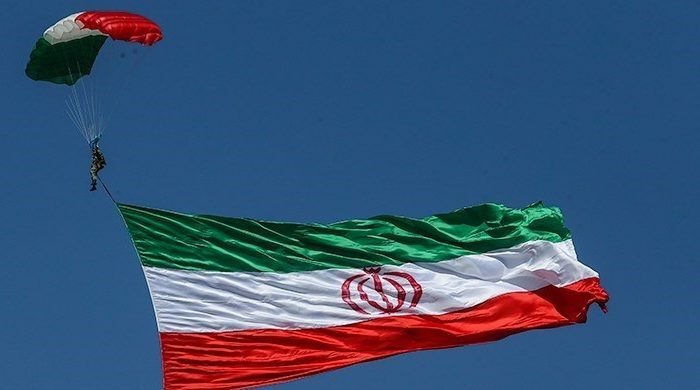 But with Iran’s enemies arrayed across the Persian Gulf, the southeastern provinces have been neglected and only a single SAM site is believed to be stationed in Chabahar, whose development is financed by India so it can reach the Central Asian republics enjoying China’s patronage. Chabahar, by the way, has direct road and rail links to Zahedan. It’s tempting to assume foreign UAVs, likely operated by the US Air Force, remain active in and around the Strait of Hormuz and stopping them is a priority. Iranian media have claimed US drones are violating national airspace on a regular basis on missions to gather critical intelligence on Iranian locations. This risk could be the justification for the Khatab al-Anbiya, or air defense forces, to be expanding its resources.